I LOVE being able to get the usage by zone in minutes by day. This was something I was capturing by hand before, so this is a great new feature. But what I’m seeing on the screen (which looks valid) and the download of the CSV data don’t match. I’m thinking that the data is a decimal place off under the hours? And the CSV data is also showing water being put down on days where there was no watering. And the time on 5/4 should be a little more than that on 5/6 and 5/8. Also, shouldn’t 5/6 and 5/8 be the same amount? I decided to look at another zone – my zone 9 which is a drip zone, and the downloaded data is identical to my zone 1 data. Is that your total runtime for those days? 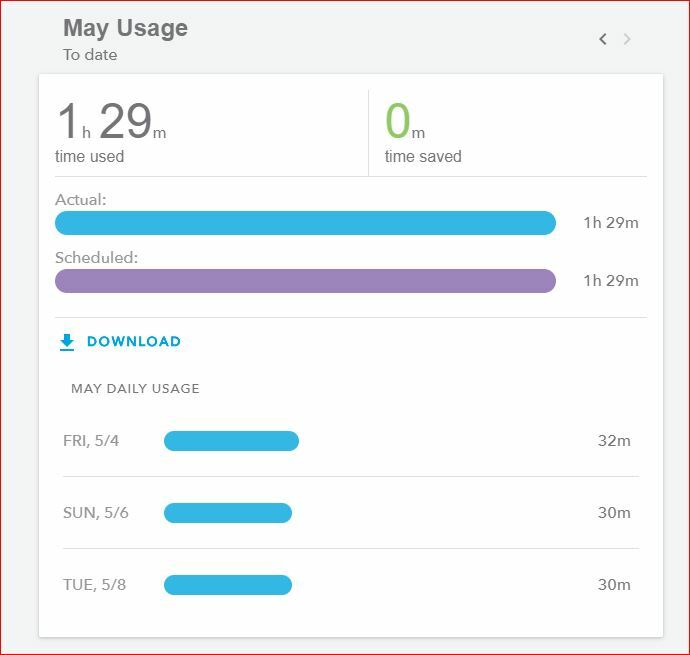 When I download from the dashboard or any zone the times line up with my total daily runtime. ahh … I see what you are saying. These may well be total runtimes for the whole system (which is totally useless to me). But I was making the download selection from the screen for the zone, which was also showing me the run times for just that zone, so I was assuming (yes, I know where that gets me), that the download data would be for that zone. I was expecting zone-by-zone run data, so you are not alone. Given the calculations required to run a flex schedule I thought the csv would allow me to wonk out in Excel at worst and look under the hood at best. What I got was surprisingly… Inadequate.